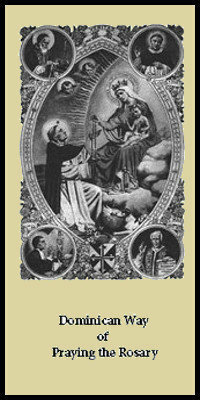 Small 3 panel fold-out leaflet that gives the Dominican manner of praying the rosary, including the opening prayers, alternating of groups in a group or family setting, and closing prayers. This catalog item is for a one hundred-pack of these leaflets. They are also available in packs of 5 or 25.